Under The Gun’s photographer, Tori Thomas had the chance to sit down with Tyler Joseph and Josh Dun of Twenty One Pilots for an interview. For the past month, Twenty One Pilots have been in LA recording for their new album to release on Fueled By Ramen later this year. The band returned to their home state of Ohio to play a weekend of shows. Their first stop was in Pittsburgh, PA for their first Pittsburgh headlining show at Stage AE on May 25th. Under The Gun has the exclusive interview with Twenty One Pilots after the jump. See what the newest members of the Fueled By Ramen family have been up to! For those that don’t know, how did you get your band name? 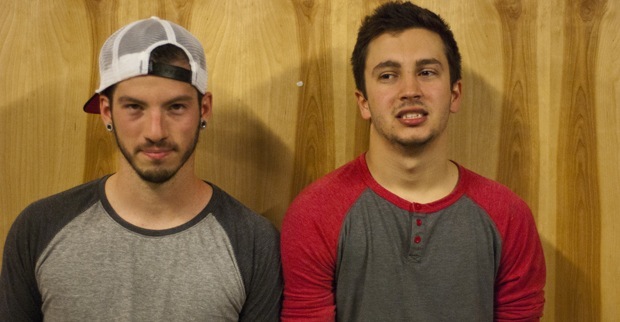 Tyler: Band name is Twenty One Pilots. I was taking a theater class at Ohio State and one of the plays we were studying was called “All My Sons” by Arthur Miller. It’s been awhile since I read the play, but the gist of the plot line is this guy who makes air plane parts for the war at the time (WWII), found out that his parts were faulty, so he comes to a moral crossroads. He has to make a decision to send the parts out or recall the parts. Really it’s what’s the right thing to do. Sending the parts would benefit him now, which is the wrong thing to do. The right thing to do would be recall the parts. He ended up sending out the parts and twenty one pilots died because he did. Actually his son was a pilot and ended up dying, but there was no way of correlating the two, but when his daughter found out he sent out the parts, she ultimately blamed her dad for her brother’s death. The rest of the play he tries to justify why he made the decision he did, and in the end he ends up killing himself. But how do we relate this to us as individuals and as a band, theres constantly decisions coming our way and crossroads and our paths and where we’re going to go and what we’re going to do. Having the band name mean something that reminds us that sometimes the right decision may not be the decision that benefits you right now, it may be the harder decision, it might be the decision that takes more work. The right decision is ultimately worth it, no matter when the reward is. It’s something we live by as a band and as individuals, it’s nice to have a band name to remind you of that. We know you just got back from LA, how was it? Tyler: It’s great, it’s actually a lot cooler, as in chilly. You wouldn’t think that. Josh: If you’re seeing palm trees, you think that it’s going to humid and tropical. Tyler: It’s more tropical in Pittsburgh. Josh: It’s a great time. We’ve been recording with a guy named Greg Wells; we’re actually not done so we are going back out there Monday to finish it out. We’ve been there for a month. Which do you like better, playing shows or recording? Josh: Both are very unique and both are very fun. I’ve only really recorded once and it’s really an experience like this, and in my own mind, I ask myself if I prefer recording or performing live. I love recording, but I think, hands down, it’s performing live for me. There’s nothing like it, especially playing in front of people who have never seen us perform. There’s nothing like that, in the sense that you you feel like you have to prove something. There’s really nothing that compares to it. Tyler: Writing and recording are two different things for me. I would say playing live shows is much more enjoyable, but writing is up there in playing live shows. When I’m in my basement writing a song, things come together and things start happening. I feel like being a good songwriter is just getting good at accidentally falling on something and knowing when to stop and focus on that thing that you accidentally did. When it comes together, it’s that moment that it’s working and you can’t stop thinking about it and all you want to do is get back into the basement to put together a demo. It’s definitely comparable to what it’s like to be out in front of a bunch of people, but we will always be a band that embraces the live show, before anything else. We’re in the studio now and recording, and I don’t think a lot of band’s think this way, but when we’re recording, we want “this part” to be recorded like this, because when we do it live it’s going to be really cool, it’s going to create a moment live. So we’re always in that space of what’s it going to be like live, instead of what fits the track when someone’s listening to the CD. Josh: When it comes down to it, as long as I’m playing my drums, I’m happy. When we’re home for a week or two off, I set my drums up in some office warehouse and hopefully play everyday and for a couple hours. What can we expect from the new record that we haven’t heard from TOP in the past? Tyler: What happened was we put out a couple demos, it’s a shame to call them demos because there are 14 songs on each demo which is a really big demo, and there is a lot of time spent recording these demos in my basement and doing the best I could to get songs where I envisioned them. Some falling a little short because I don’t know much about being an engineer, I’m a songwriter, primarily. But that’s what we were, living, breathing songs of Twenty One Pilots, for awhile we would travel around and play in front of ten people a night and then focus on our hometown and get a lot of people to come out. We didn’t really go into a studio and spend a lot of money as a baby band because 1. we didn’t want to get in debt and 2. we didn’t have the money to do so. Now that we have a budge to record, it’s an interesting step from going from Do It Yourself to doing it at such a high level. So when we decided to get into the studio, there’s a lot of new songs we’re working on and then there’s some songs from the demos that weren’t done justice, so the new CD we’re putting out will consist of one’s we’re known for playing live and a healthy mix of new ones. Josh: We are looking at this CD as our first national release, with that we want to take what we’ve done and revamp it and make it bigger. Fueled By Ramen has a track record for being fair to their artist’s creative needs. How has your experience with the label been while recording your new record? Tyler: It’s weird cause now, a label gets a bad rep when things are going bad; when things are going good with a label, things are going really good. It’s the risk that’s involved when you get into a partnership with a company that believes in what you’re doing. Because they are putting money into, investing in it, and putting their name on it, they want to know what is going on in the creative process. We’ve been updating the guys in charge of the label, almost every other day, just sending them rough mixes of what we’ve been working on in the studio. This is Josh and I’s first time recording an album in the industry, and we don’t really know how the dialogue is supposed to go. What we’ve been told by our manager and people around us, “your label is really trusting you to run with what you want to do musically,” because a lot of times there will be an A&R guy in the studio suggesting things and never really being satisfied with the direction the songs are going. Which I can’t imagine, the songs are like my baby. Having someone suggest these small tweaks seems imposing at some times, it’s part of the game. It’s been going really really well, so far. How did you pick Fueled By Ramen? Josh: There was a time that got really crazy, there were options, from what we were told, we don’t know anything about it. It was really nice to have options, but it was also very stressful because there were a lot of great options. To go along with the last question, not only creative control, but a creative relationship, it came down to who do we feel comfortable with creatively. I think that’s really the biggest thing. Signing with a label, there’s a fear among your fans that they’re going to lose what they fell in love with, what they’ve become a fan of; we wanted to keep as much of that in tacked as possible. Instinctively, we both thought this label would allow us to keep as much of that intact. Did you reach out to any labels or did they come to you? Josh: No we didn’t reach out to any labels. Tyler: We didn’t even know what that meant. Who’s number do we call. If you want a record label call “1-800-LABEL-ME” (jokingly) We were very strategic and focused and dedicated to our local fan base in Ohio. We were doing what you thought you were supposed to do as a local band, which is to build a fan base around you and not harass them, not take advantage of them, but to trust them, so they trust you. And when you say come to this show, they’ll come to that show. Since we were able to build that trust, we were able to fill up a room at Newport Music Hall in Columbus, OH, and I guess when a local band sells the place out, it just doesn’t happen very often. We were like “it doesn’t?” When your in music and you’re pursuing as a local band, everyone and their mom are in a band trying to make it, and we didn’t really know where we lined up. We don’t know how it happened, but it just steam rolled into one label hearing, then another, then another; we actually got turned into this thing that was larger than life and it was really a lot of pressure to make music. Today is our first time every doing headlining in Pittsburgh, so we don’t even know what tonight will look like, so we’re not really that seasoned as a band for traveling and touring. It just all came at once, it was crazy, I’ll never forget it. You made your start in Ohio with a massive fan base; you now have the opportunity to appeal to a much larger following, internationally even. Where are you looking forward to touring the most? Tyler: It’s interesting, we’ve played so many bad shows, when you say bad shows, there are so many things that could make a show bad, but each show was worth it. We put a lot of effort into each show, playing in front of ten people, not getting paid, being stranded in a city, shows fall through, it just the concept of being on a consistent tour, in front of new people, is the coolest thing to us. We just want to play anywhere, anytime, any country. We’re just looking forward to being in front of people because our career so far has been worrying about if people are going to be there. Josh: That being said, Madison Square Garden and Glastonbury Festival. That’s just the dream. If not, then hopefully just play in front of some people. So you announced that you are on a leg of the Neon Trees tour, are you excited about the tour later this summer? Tyler: It’s actually our first legit tour. Right off the bat, getting done with the album and going out. This band, Walk The Moon are on that bill as well, and their from Cincinnati. We actually played together a long time ago, I don’t know if they remember it, but I do because they were really good. It was in Kent at the Outpost, it was in front of no one, we got up and played in front of no one, and then they got up and played in front of no one. It’s kinda cool, they were a little bit further down the road than us when it came to our career and watching them make a label decision, and make decisions to further themselves in their career. It’s almost been like we’ve been behind them, watching them, with the things they do. I’m excited to meet them and be like “do you remember when we played Kent?” It’s kind of weird that out of all the bands in the world, to being a support with is this other band from Ohio. It will be cool to represent Ohio, going all over the place. Your live performances are big and flashy, despite being just two of you on stage. What are you looking to add to your shows as you begin nation-wide touring? Josh: We answer that question, when we get to it. Opening is a different story. For our hometown shows, we know we would be bigger, we would brainstorm a month and a half or two months in advance, for what we could do this time, or add something. Tyler: We’ve actually started brainstorming for the next one, and I’ve got to tell you, some of these are just ridiculous. Josh: There’s really endless options, trying to think outside the box. What has someone done or something creative or different. Or take something else that you’ve seen somewhere else that doesn’t have anything to do with music, and incorporate it into a live show somehow. I don’t what I personally would like to see added, but I guess a lot of stuff. Tyler: Camels, with LED lights on them. Tyler: We’re finishing out the album, probably by early/mid June. We have a few random shows around, just to keep us on our toes, as we perform. We’ve got the Neon Trees run, which is going to be really cool. We actually had dinner with our booking agent the other day, and he was like “I hope you guys realize, once you leave on that Neon Trees run, you’re never coming home.” We were like “perfect,” because that’s what we want to do, travel and play. Because we’re partnered with such a great booking agency, from CAA, who knows what we’ll be doing at the end of the year. Hopefully releasing the album at the end of fall-ish, it’s still tentative. Hopefully just stay on the road and call our moms once in awhile. Up until now, you’ve used what you’ve called a “pocket” technique, doing shows with little push in certain areas of your home state to keep the experience ideal and special for those who come to see you perform. Is this something you’ll continue to do, if you have any control over the touring schedule? Tyler: That’s a great question, you said it better than I did. Our strategy as a local band you gotta have a nucleus, a focal point, that was Columbus for us. We’d go around and create fans and then not bother them for months, until we said this is the show you go to, and that’s how you can get a lot of people in one place. That was our strategy, because our goal at that time was, “let’s rise above Ohio.” We wanted to rise up in our local scene. Whether or not a strategy like that really translates into a national strategy is still out. The way we’re going to attack is, well we want to be a headline spot as soon as possible, and this play in Pittsburgh, we opened up for Cobra Starship, not too long ago, and our strategy was to try to win people over as an opening band, in front of a lot of people. Then turn it around and on stage being able to say we’re going to be playing this date at a smaller room, smaller venue, but then start turning those people around and start creating fans. It really has a lot to do with where we go and we want to revisit that place, as we go as an opener, we want to try and tackle it as a headliner in smaller venues. Josh: We still aren’t sure on it, we’re in the thick of it; our brains are getting the songs done and recorded. Not to say we haven’t been thinking about album titles, we have some ideas, but they aren’t set in stone. Tyler: There are so many other players involved putting their input on when things drop and everything. It’s not only that, but we’re in control creatively, when it comes to the album cover, what the album’s going to be called, what songs are on there, what order, how many songs; we definitely have a lot of say in that, when your in a partnership, those things need to get approved. They don’t want to hear about the decision being made before they were told about it. Josh: And there’s strategy on when to release it, before we were like “we’re done with it, let’s put it up on iTunes, and have a CD release show.” With this there’s other bands involved, where they’re focused on what they want to do. Tyler: I can tell you that it will be out this year, which is quick actually. Josh: My favorite song, I probably speak for both of us, is a song of ours called “Trees.” We usually play it last or at least really close to the end. For me, I noticed it pretty quickly after Tyler and I started playing music together, we try to play as hard as we can, and give all of our energy. And that can wear you out physically, but it comes to the point of the set where we play that song, I don’t know what it is, but I think for both of us, when the song starts, I feel like it’s the first song again, physically, mentally, and spiritually. It does something really cool, I enjoy that song quite a lot. Tyler: I also like to play “Ode To Sleep,” because a lot of times we open up with that and my favorite thing to do is play in front of people who haven’t seen us before, because I like to smack them in the face with something, and that song is really good for that. Josh: I’ve got to start bringing wacky stuff, so I can answer that. Yeah, deodorant. A lot has happened for you in the past year. A lot will happen for you in the coming year. Where do you see yourself in 5 years? Josh: Still in Columbus, living in Columbus. Tyler: Yeah, we don’t want to move out of Ohio. The more and more we travel around, the more and more we like the fact that we’re from Ohio. “What Ohio?” Well we have a story from how we got from Ohio to wherever we are now. We like how the story starts, there may come a time where we have to move, to make things easier, but I definitely want to be based out of Ohio all the time. I don’t know why some bands would limit themselves on what they want to do, but we’re open with each other and the rest of the guys involved in this band, we want to be the biggest band there is. Whether or not it’s too far fetched for that to happen in five years is not something I worry about. Look out for Tori Thomas’ photos from the show soon! These guys put on the best live show ever. Thanks so much for the feedback! We appreciate it!